MARCONI WIRELESS (PRE-1920 RADIOS). Marconi sets pictured are the English and American Magnetic Detectors, Multiple tuner, Crystal 16, 103, 106B, Coherer, Spark coil, Trenches set, and others. Also pictured is the United Wireless Type E Tuner. Read the interesting history of the Marconi 16 that was at the bottom of the ocean for about 80 years before it was raised and conserved. WIRELESS (PRE-1920 RADIOS) other than Marconi. 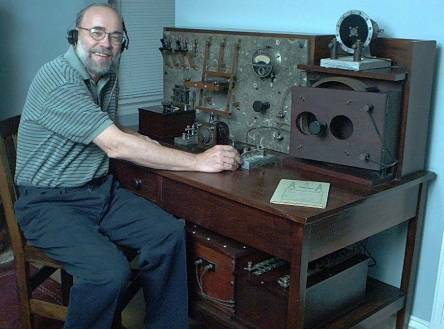 Some of the Wireless sets pictured at the museum are: Chambers Spherical Audion Set, Clapp-Eastham 1K transmitter, Clapp-Eastham Blitzen receiver, Deforest RJ4, General Radio BC-14A & BC-15A, International Signal SE 712A, NESCO CN112, Mark III Tuner, Sperry SE 1012, Fleming Valve & Radioson Electrolytic receiver, Electro Importing detector, Western Electric SCR 68, WSA IP 500 & IP 501. Other radios. TUBES AND VALVES. Some of the tubes pictured at this museum are: Geissler tubes, Crookes Tube, Deforest Spherical Audion, R Valve, Early x-ray tube, Western Electric tubes, Deforest tubes, White valve, Round valve, Fleming valves and more. CRYSTAL SET RADIOS. A few of the antique Crystal radios shown are: AC Gilbert, Aerial Electric Crystal Mystery, AGF, BTH, Revophone, Deforest Everyman, Efescaphone, Elwell, Federal Junior, Marconi Crystal sets, Rao Hidden Coil, TMC #2, W & M, crystal set, and others. ANTIQUE RADIOS FROM THE 1920S. Some of the radios pictured in the Stone Vintage Radio and Tube Museum include the Amrad 3108 & 2634, Atwater Kent Breadboards, Cutting & Washington 11A, Deforest RadioCraft Interpanel, Deforest D-7A, Federal 61, The Grebe CR18, Grebe RORK, Grebe CR3, Kennedy 220 & 525, Loewe OE333, The Paragon RA 10 & DA 2, Telmaco TDA1, Western Electric 4D, and Zenith 4R. Many more. ANTIQUE RADIOS (1930-1960S) include the Atwater Kent 84 cathedral, Emerson Mae West, Jackson Bell 62 Cathedral, National AGS, Pye M78F, Radio Lamp Company, Scott All Wave 23, Sparton Bluebird, and the Zenith 15S372 Console among others. ANTIQUE RADIO ADVERTISING. Pictured are an Atwater Kent glass sign, Philco Neon Clock, RCA Cloth Banner, RCA Brass Sign, and others. SPEAKERS, MICROPHONES AND OTHER ANTIQUE RADIO GEAR. This gallery pictures an ornate Amplion Chinese Speaker, Amplion AR 19 Dragon Horn Speaker, Grigsby-Grunow Horn Speaker, Kennedy Horn Speaker, Magnavox horn speaker, and Western Electric 14A Loud Speaker System. Others. In addition there are ARTICLES ON ANTIQUE RADIOS I HAVE WRITTEN where you can learn more about the history of radio and tubes, ANTIQUE RADIOS FOR SALE, WANTED ANTIQUE RADIOS I am searching for, WANTED RADIO PARTS, INFO OR SELL YOUR RADIO or radio collection, any of MY EBAY AUCTIONS that are going at the time, and TUBES AND VALVES FOR SALE. There is a page ABOUT ME AND THE COLLECTION, mutual antique radio LINKS, and a way to CONTACT ME at stonevintageradio@gmail.com if you have questions, suggestions or something to sell. All of these are listed in the menu on the left. Each gallery of the museum has a number of radios illustrated-more than are listed here. Click on the image of any antique radio or tube and you will see a larger image and a description of the set. With only two clicks of the mouse, you can reach any radio exhibit of interest in the entire site. You also can use the search engine to find every antique radio or tube in the website. I am always looking for other radios, wireless and spark sets, radio tubes, and tube amplifiers like those pictured here for the museum. If you have something you want to go to a good home, or if you just want some information on an old radio, please get in touch with me (click the INFO OR SELL YOUR RADIO here or the button at the top of the page). I will do my best to help or suggest where you can go for help. Do read the FAQ section first because I may have an answer to your question already there including how to estimate the value of your radio. I travel quite a bit and can't read email every day, so please be patient-I will respond to your request and try to help as soon as I am able. There is a lot to do here, so click away and enjoy! I think you will learn a lot and find the history of early radio very fascinating.